Honor Art students residing in McCracken County and the mayor of Paducah, Brandi Harless as well as Mary Hammond, a UNESCO Commissioner. 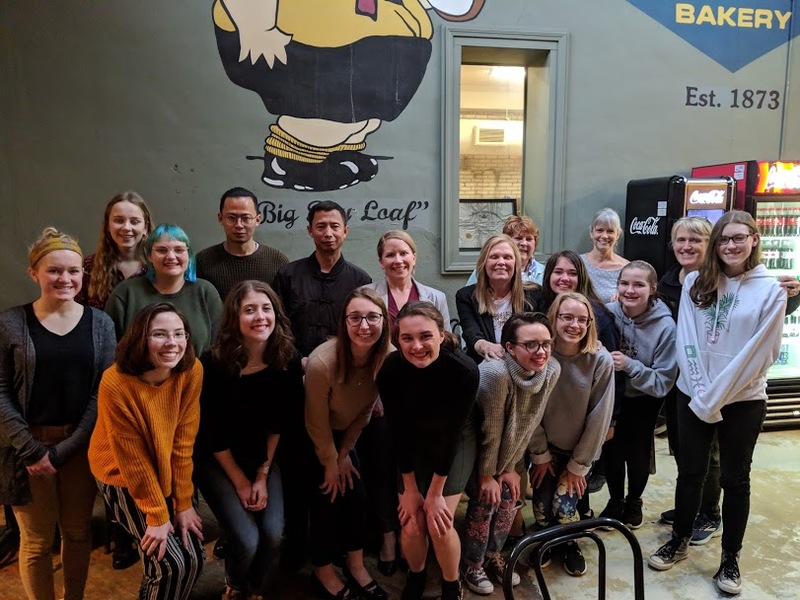 Cleves, March 2019 - Art students from Taylor High School, a member of the UNESCO Associated Schools Network (ASPnet), traveled to Paducah, a UNESCO Creative City of Crafts & Folk Art, for an immersive study tour on March 20-22, 2019. The UNESCO Associated Schools Network (ASPnet) consists of over 11,500 ASPnet member schools in 182 countries working in support of international understanding, peace, intercultural dialogue, sustainable development, and quality education. Paducah was designated a Creative City in November 2013 for the city’s important role in the connectivity of cultures through creativity. The UNESCO Creative Cities Network is a forum for brainstorming the role of creativity as a driver and facilitator for sustainable development and recognizes that harnessing and cultivating creativity is essential to the prosperity of any city. Marney Murphy, the District’s Media Specialist, and Sue Diemer, Taylor High School Art Teacher, envisioned the creative learning experience to expose the students to cultural richness and creative industries. Hands-on creative experiences at Paducah School of Art & Design and collaborative learning with art students at Paducah Tilghman High School and McCracken County High School. Engagement with local artists and visiting resident artists including Kentucky cellist, Ben Sollee, and Ma Mingkui and Ma Xinkai, artists from Jingdezhen, China, a UNESCO Creative City of Crafts & Folk Art. Discovery of regional cultural attractions including the National Quilt Museum, historic Paducah Riverfront and “Wall to Wall” Floodwall Murals.